Oxfordshire County Council wants to know what you think about its draft proposal to abolish all six councils in Oxfordshire and replace them with a one new council for the whole county, called a ‘unitary’ council. Central government is changing the way councils are funded, and councils will soon have to pay for services mainly from council tax and business rates. Unless local government is reorganised, Oxfordshire councils will not be able to pay for vital public services for local communities and vulnerable people as the population increases and gets older. Oxfordshire currently has a two-tier local government – a county council plus five district and city councils. Oxfordshire County Council thinks that all of Oxfordshire’s six councils should be abolished and replaced with one new unitary council which would save £20m each year – money that would pay for better services and keep council tax low. That money would be enough to fill over 300,000 potholes or provide 1 million hours of home care. The new council would be simpler for residents and business, with one website and one point of contact. One councillor would represent your community and be accountable for all services. As members of an ‘area board’ serving the existing district or city areas, each councillor would take decisions affecting their community and also the county as a whole. Environmental services such as street cleaning, countryside services and grounds maintenance would be properly joined up and managed locally to respond to community needs. Bringing together social services, housing, leisure and welfare benefits would mean joined up support for people who need extra help, improving health and wellbeing. And joining up planning, housing, jobs and transport would mean Oxfordshire’s housing shortage can be addressed, along with investment in vital infrastructure such as roads. Without changing local government in Oxfordshire, further service cuts may be needed. The government is reducing funding and a unitary council is more financially sustainable in the long term. 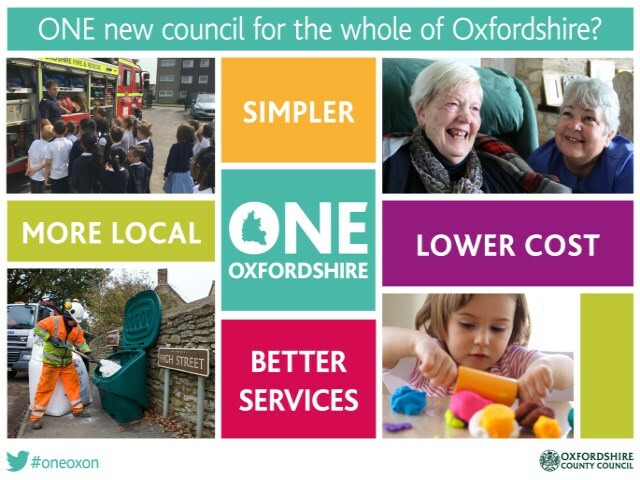 Oxfordshire County Council believes a new council for the whole county makes most sense. Simpler. Better services. More local. Lower cost. That’s what ‘One Oxfordshire’ means. This is a draft proposal and Oxfordshire County Council wants to hear from residents, before finalising the proposal and sending it to the government for a decision. To find out more and have your say, go to www.better-oxfordshire.org or come to a drop-in event at a library near you. Dates of the events are available on the website.